Don't just keep your horse warm and toasty this year. 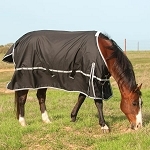 Keep your horse dry as well with one of our winter waterproof turnout horse blankets. All of the waterproof blankets are durable and will last. With these blankets you can let your horse out of the barn to run and play without worrying if it is going to rain, snow, or sleet while you are gone. There is nothing worse than to have a stable blanket on and leave the horse in the turnout pen and come home to a soaking wet blanket, wet horse, and with temps below 30 degrees. 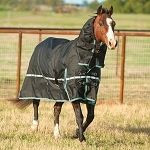 Get your waterproof turnout horse blanket today - Your horse will thank you for it.